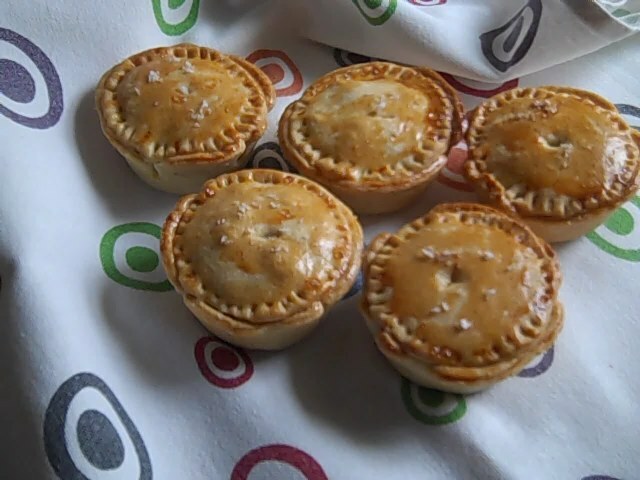 Adding a little dried English mustard to the pastry will give these little pies a lovely colour and flavour if you make your own pastry, but if like me your no good at pastry making or if your short on time, ready made pastry will work just as well. To make the filling, heat the oil and butter in a frying pan. Add the steak, shallots, mushrooms and bay and fry, stirring until the steak is evenly browned. Sprinkle the flour over the top, mix together, then add the brown ale, stock, tomato puree and a little salt and pepper. Simmer for 5 minutes, stirring from time to time, until the sauce has thickened. Leave to cool, then remove the bay. Pre heat the oven to 180C/gas 4. Lightly grease a 12 hole muffin tin. Roll two-thirds of the pastry out thinly. Using a plain cookie cutter, stamp out 12 circles, each 10cm/4ins in diameter. Press these gently into the prepared muffin tin. Brush the top edges of the pie cases with a little of the egg glaze, then spoon in the filling. Roll out the reserved pastry and any trimmings and using a plain cookie cutter, stamp out 12 circles, each 7cm/3ins in diameter for the lids. Arrange these on top of the pies, pressing the edges together well with the tines of a fork to seal. Brush egg glaze over the tops. Sprinkle with a little salt. Bake for 25 minutes, or until the pastry is golden. Leave to cool in the tin for 10 minutes, then loosen with a round bladed knife and transfer to a wire rack.